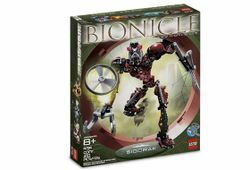 8756 Sidorak is a large BIONICLE set released in 2005. He is the leader of the Visorak. Sidorak was released in 2005 as one of the Titans sets. Gears on his shoulders allowed one to swing his arms. His herding blade could quickly switch from an inactive to active position, and a claw held his silver Rhotuka spinner until one chose to manually release their grip and fire the spinner. He could be combined with Keetongu to create Sentrakh, or with both Keetongu and Roodaka to create 10203 Voporak. Before leading the Visorak, Sidorak held a position of minor power on Stelt. On Stelt, there were two classes: the ruling class Sidorak was in, and the servant class Krekka was in. He kept advancing in the eyes of his leaders by claiming credit for the victories obtained below him; if a commander below him objected to his credit-stealing, Sidorak would simply dispatch him on a dangerous mission from which that commander would not return. He also betrayed his clan leader on the island, who later transformed into the Voporak. At one point six thousand years prior to the Great Cataclysm, Sidorak was considered for recruitment into the Dark Hunters. His lack of fighting skill, however, led him to be easily defeated in a training exercise by a Dark Hunter codenamed Gladiator, so his membership was denied. But he was still seen as useful to the Hunters and therefore allowed to live. His talent for treachery caught the eye of the Brotherhood, and they employed him as their courier to Xia. Eventually, Teridax made Sidorak a lieutenant, with Roodaka. These two constantly feuded for Teridax's favor, however, Sidorak hoped to forge an alliance with Roodaka, which she agreed to later on, although secretly planned to have him killed before it would come to pass. When the Brotherhood's bodyguards, the Toa Hagah, discovered the group's corruption, they rebelled. However, Roodaka caught them and mutated them into small, Rahkshi-faced creatures she called "Rahaga". Sidorak took the credit for this idea, and was therefore appointed King of the Brotherhood's Visorak hordes, while Roodaka was given second-in-command. Although he lead the Visorak to victory on many occasions, Sidorak still was insecure about his position as their leader. The Visorak didn't notice this, but Roodaka did. In their time as the Visorak's leaders, Sidorak still pursued a formal alliance with Roodaka; specifically, he repeatedly asked her to marry him. In the BIONICLE world, "marriage" is purely a political alliance: such a union would give Sidorak valuable influence with Roodaka's race, and Roodaka would become a full-fledged Queen of the Visorak and gain some of the power that she desires. However, she would always reject his advances. As King, Sidorak preferred to personally lead his troops on the battlefield; and gave all appearances of being confident and in control. However, some of this may be compensating for the fact that he knew that he had not earned his position, but rather gained it by backstabbing. While he might have been insecure about his leadership, he was absolutely confident in his manipulation skills and did not believe that he could be out manipulated by anyone. After Makuta was imprisoned during the Great Cataclysm, he telepathically summoned his servants to rescue him, and Sidorak led the hordes to the city of Metru Nui to do so and gain his favor. His leadership led the Visorak to quickly take over the city, hunting down and capturing any creature that they found. Unfortunately for the Master of Shadows, Sidorak's ambition rose, and he sought to claim Makuta's power while he was imprisoned. When Sidorak and Roodaka invaded Metru Nui, they took the Coliseum as their main base. When the Visorak reported that the Toa Metru were captured, Sidorak ordered them to be killed. When the Visorak who reported the news wanted to leave, Roodaka stopped the Visorak and advised Sidorak to make their death more "legendary." Sidorak agreed, calling instead for a mutation and disposal of the Toa. From then on, the Toa Hordika would be a constant thorn in Sidorak's side as he tried to exert more control over Metru Nui. In his efforts to destroy them, Sidorak would unleash massive hordes of Visorak, even unleashing the fearsome Zivon at Roodaka's suggestion. Despite his best efforts, he was unable to eliminate the Hordika and their allies. When Matau and Iruini were in a hangar looking for Airship parts, Sidorak attacked the hangar with an army of Visorak. Sidorak was giving orders from a tower in Le-Metru to the Visorak. Later, Bomonga and Whenua escaped the Field of Shadows and were captured by Sidorak. Sidorak then ordered the Zivon to be unleashed. During the ensuing fight, Sidorak left the tower, fleeing from the Toa Hordika, and retreated to the Coliseum. Later, when Vakama betrayed his fellow Toa Hordika, he approached the Coliseum and banged on its doors to gain entrance. Sidorak spoke to him via speakers, but refused to believe Vakama had truly come to join him. He permitted him, however, when Vakama presented five of the Rahaga he had captured for him. Shortly afterwards, Roodaka proposed that Vakama was a fitting master for the Visorak horde, but Sidorak refused. Roodaka, already prepared for such an answer, insisted it would be an engagement gift. Presented with the possibility of gaining influence on Xia through their alliance, Sidorak agreed and made Vakama a commander of the Visorak. When the remaining Toa Hordika, along with Rahaga Norik and Keetongu, attacked the Coliseum, Sidorak was confronted by Keetongu scaling the walls of the building. He attempted to blast him off, but missed repeatedly. After Roodaka managed to knock Keetongu off, she tricked Sidorak into following her to make sure that the Rahi was dead. When they arrived, Roodaka left Sidorak alone with Keetongu, who had survived the fall. Sidorak went to finish off the wounded Rahi, only to find that Keetongu was not wounded, but angered. Realizing that he cannot win against a furious Rahi, he told Roodaka to help him, but she refused. Sidorak then realized that she angered Keetongu on purpose; Keetongu would kill him and Roodaka would be the Visorak's Queen without having to share the power with anyone. Acknowledging that he had been outwitted, he did nothing to stop the fatal blow. Sidorak was then brutally crushed under Keetongu's fists and killed. He was unwittingly avenged when Vakama, whom he had placed in control of the Visorak horde, commanded them to abandon Roodaka, which they did. As a result of Roodaka's role in Sidorak's murder, a reward was posted for her capture on Sidorak's home island of Stelt. Though he was not thought of as very important at his homeland, his species would not let the murder of one of their own occur without repercussions. Sidorak was a great leader and tactician, directing the Visorak hordes with deadly precision and efficiency. However, while he had great strength (not as strong as Keetongu, but certainly more powerful than any Toa), he was not a great fighter, and knew well enough to retreat when he was outmatched. He was also skilled at manipulation, but blind to the fact that he could be manipulated himself. Sidorak carried with him an Obedience Rhotuka, which was a powerful spinner that forced its victims to follow Sidorak's commands for 24 hours. He also carried a herding blade on his left arm that he used to direct the Visorak in battle or to strike his enemies (in Web of Shadows as well as BIONICLE Heroes, he also fired red energy blasts from it); and a Rhotuka launcher that fired obedience spinners, which made targets obey his commands. As to the inaccuracy, Sidorak could have just had bad aim. This is a description taken from LEGO.com. Please do not modify it. (see an archive of the product's page) King of the Visorak! Mighty leader of the Visorak horde, Sidorak is a veteran of a thousand conquests. Now he is determined to use his spider creature legions to overrun Metru Nui and defeat the Toa Hordika! With his herding blade, he can command the Visorak without needing to speak. His Rhotuka spinners compel anyone they strike to obey him completely. New feature! Pull the rip-cord to launch his spinner up to 50 feet/15 metres! Sidorak stands over 11 inches/28 cm high! Includes building instructions to combine with #8755 Keetongu to create Sentrakh! Sidorak did not always carry a Herding Blade. Sidorak was very skilled at manipulating people, but he never realized he would be manipulated. Paul Dobson provided Sidorak's voice in Web of Shadows. Sidorak appears as an enemy boss in the non-canon video game, BIONICLE Heroes. In the film, "Web of Shadows" whenever Sidorak exhales steam comes out of his mouth. In the same film, he is portrayed as insecure, a coward, unwilling to fight, socially inept, and stupid, likely to provide humour to a child audience, which explains his downfall (that is, his demise at the hands of Keetongu). Pulling the ripcord out of the launcher really fast will launch the spinner. General information comes from the BIONICLE Adventures book series; see List of BIONICLE media. This page uses content from BIONICLEsector01. The original article was at Sidorak. The list of authors can be seen in the page history. As with Brickipedia, the text of BIONICLEsector01 is available under the GNU Free Documentation License, however please help to make this a unique article to Brickipedia in any way you can.